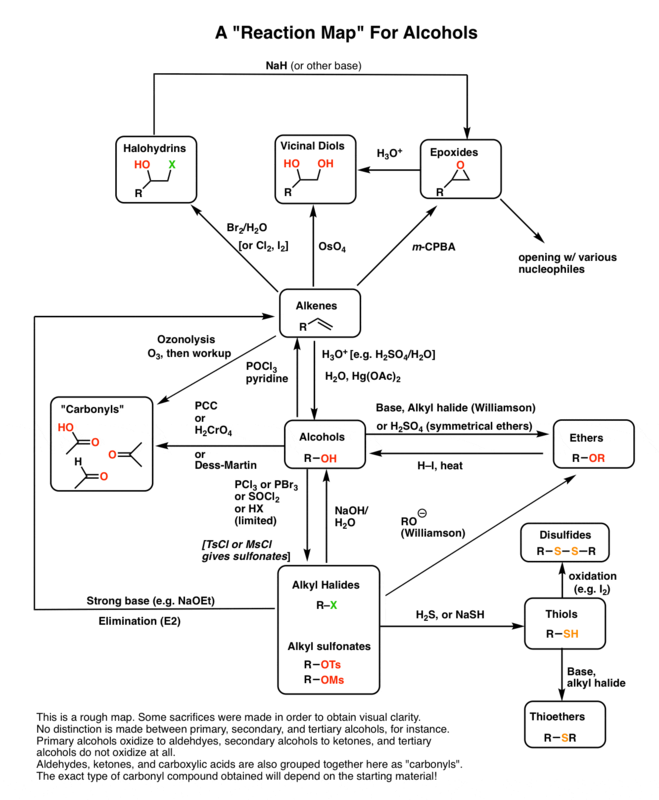 Having now finished (at long last) covering the key reactions of alcohols, let’s stop to put everything in perspective. It’s not easy to do this without making some tradeoffs. Here, you’ll note that “alcohols” are all bunched up into a single box, which includes primary, secondary, and tertiary alcohols. As we’ve stated before, not all reactions work on all types of alcohols (for instance, we can’t oxidize tertiary alcohols). Using this map requires some judgement. While it would have been possible to separate the categories, that would have ended up making the map a lot more visually distracting. So in order to use this properly, it’s up to you to understand which reactions work for each type of alcohol [which is covered in the initial blog posts on each topic, as well as in the notes on the reaction map below]. Similarly, all the “carbonyls” (aldehydes, ketones, carboxylic acids, esters) have been grouped together, for now. When we cover future sections we’ll expand them out, but at this stage I wanted to keep things as simple as possible. You might recall that my previous post on synthesis covered reactions of alkanes, alkyl halides, alkenes, and alkynes. Let’s now take the same “map” and add alcohols. Things are starting to get crowded – I count 69 different reactions! 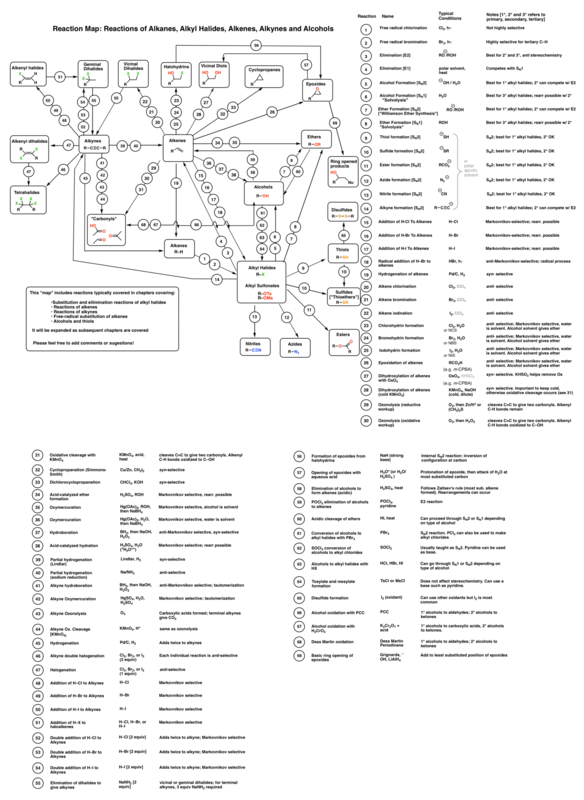 This map covers most of the reactions you’ll see for alcohols, alkenes, alkynes, alkanes, and alkyl halides. One thing it doesn’t cover is formation of the various conjugate bases and acids from each species. I welcome comments and suggestions – and would even pay for someone who has design skills to make this look better! In the next series on MOC, we’ll cover reactions of organometallics. Hopefully this won’t take nearly a year like this series on alcohols has! I gotta say, sir, your website is a boon to me. All my answers are hidden in here. I really appreciate what you have achieved and wish you all the very best for future. Just wanted to know, where can I put a doubt in organic chemistry if I have any? I meant some question or something? Very interesting and smart approach. I am not chemist but I love it. Now, I am in a project to find the most simple and cheap ways to prepare some molecules. I live in Colombia and many products are very expensive. I need find a simple and cheap way of having heptanol and Propanaldhyde. The first costs 110 dollars 1 liter here. The second one about 80 dollars 1 liter. Perhaps its possible to find a suitable way. If so, I would can to begin a test using these products in animals. Current pyrolisis of castor oil produces heptaldehyde that can be converted to heptanol. This process its not as cheap as I thought. Can’t really help you there. Good luck.